The tears rippled over my eyes, blurring my vision. The boat soared over the wake the wind created in the open water, rising up and slamming down repeatedly. I gripped my camera in one hand, clutching the long length of my zoom lens, and held onto the seat railing with the other. I was laughing, but the noise-cancelling headphones kept me from hearing any of it. If you’ve never been on a Florida airboat before, I highly recommend it, and not just for the fun of flying through a marsh on seats strapped to a giant fan, but there’s really no better way to see Florida wildlife. Up early and grabbing a quick breakfast, the group of us were out the door pretty quick in order to get to the lake to meet our airboat pilot. I grabbed my zoom lens, leaving the other lenses behind, and made sure my memory cards had tons of space. When M and I went on a similar excursion during our visit to Florida in April, I snapped hundreds of photos, I think I almost topped out at 500, so this time I made sure to have lots of space. And while the alligators are always a main attraction for these rides, as many of you may know, I was way more excited for the birds. There’s no other way to get SO close to big wading birds then on an airboat. While the more timid ones will fly off, many of them will simply stand there and stare you down, waiting for the large monstrosity of a boat to pass them by. Going back to when M and I came to Florida, the company we took our airboat ride with was called Florida Crackers, and I highly recommend them, but they were much further south, closer to Vero Beach. We were too far north to travel all the way, so we found a closer one. 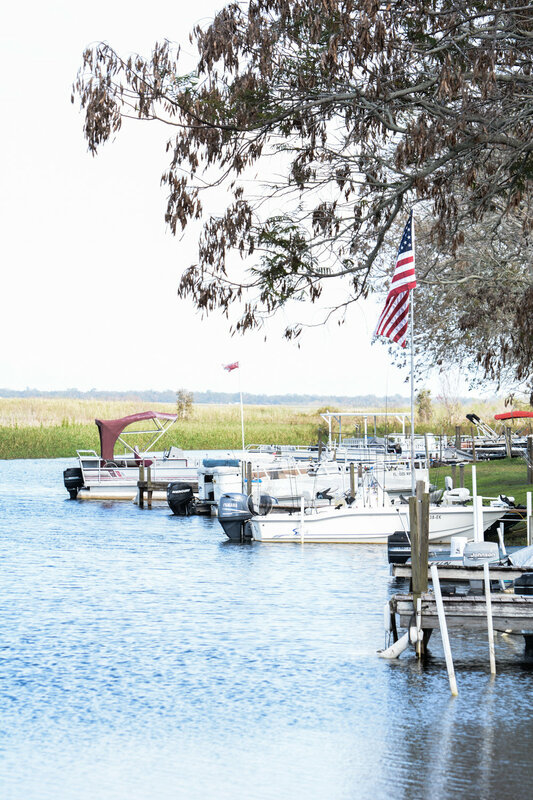 Wild Willy’s (great name), gives their boat tours out of Lake Tohopekaliga (or Lake Toho), and is the largest lake in Osceola County, FL at nearly 19,000 acres. As a side note, Orange Lake, the resort we’re staying in, is located in Kissimmee, the largest city and county seat for Osceola. Anyway, back to Lake Toho, I was pretty excited going into it as a little bit of background research found that the area is known for its bass fishing and bird watching. So, I was going in prepped to do some awesome birding. The lake is also one of many Fish Management Areas (FMAs) in the county, which are governed by Florida Fish and Wildlife Conservation Commission, which helps to stock the lakes, conserve fish populations and regulates the licensing and bag limits for those looking to fish in the FMAs. With the footnote stuff out of the way, let’s get to the boating. I stepped off the dock, grabbed my seat, and immediately started snapping. A large Wood Stork stood eyeing us from the long marsh grass on the other side of the thin channel. I stretched out the lens for optimum bokeh and snapped away. 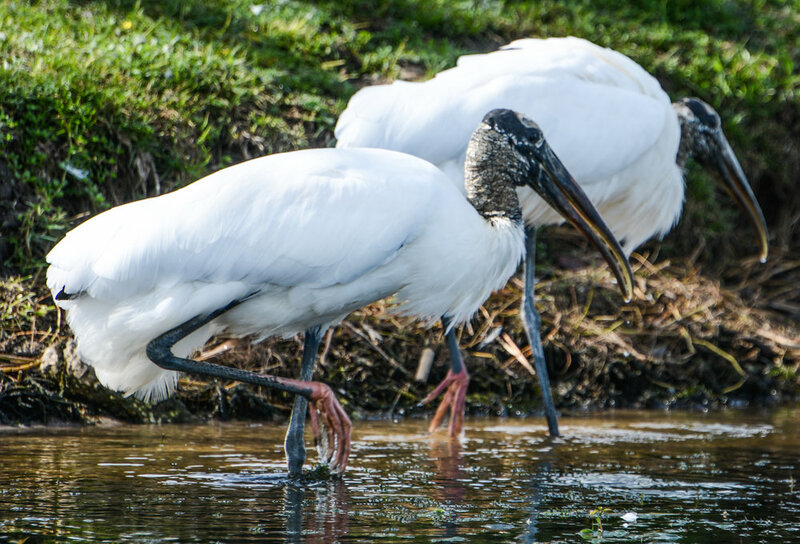 The Wood Stork is pretty common in Florida, and is actually one of their signature wading birds. 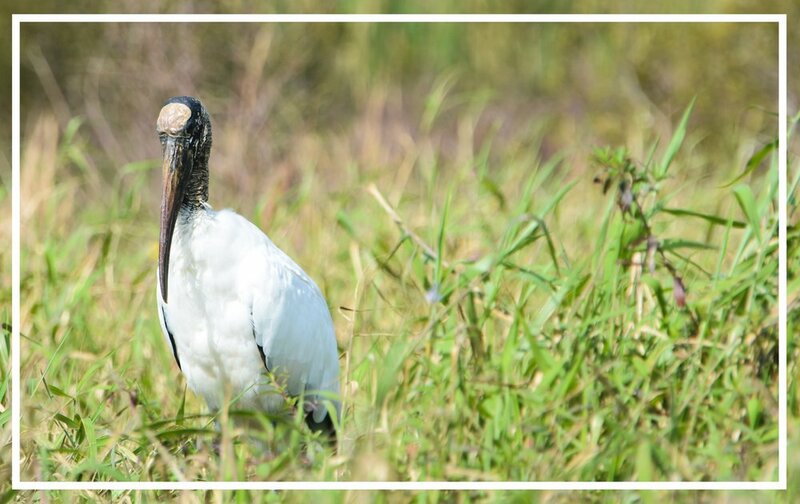 However, due to destruction of their marshland habitat, the Wood Stork is listed as “threatened” in the state and by the American government. Thankfully, it wouldn’t be the last Wood Stork we came across. As the fan of our airboat chortled away quietly behind us, pushing us out to the open water, a flock of Storks covered a nearby point, surrounding a small wooden hut. The small white building was no bigger than a shed, and as we rounded to the other side, I could see three tubes running out the opposite side and into the water. A collection of Storks were gathered beneath it, picking away at the water. It was a fish cleaning hut. When we got close, our airboat pilot Tyler called out to the two men standing inside. “How many you catch today!” he shouted in his Florida drawl. “Got six,” a voice yelled back. Tyler laughed, shaking his head. “Oh yeah right,” he called, returning to his seat. Then to us, he said. With that done, we pushed out into open water, the fan of the airboat erupting first into a growl and then a screaming roar as the nose lifted out of the water and we sped forward. American Coots seemed to coat the water, flapping their wings wildly and running across the water as they fled from the speeding boat. It’s actually pretty funny to watch as it literally looks like the little guys are running on water. Egrets and cormorants dotted a few trees and a Great Blue Heron soared by overheard, looking more like a pterodactyl than a wading bird. The boat weaved left, then right as we entered a hallway of long grasses. Pushing into a wide patch of open water, the wind picked up and we slammed up and down over the waves. A burst of cold water sprayed over the edge of the boat hitting me smack in the face and speckling my camera body. I clutched it closer as my parents laughed from the seats beside me. Liam, Daniel and Issac, occupied the seats in front. Heading back into the marsh reeds closer to shore, the boat pushed along a large berm of trees before the engine cut out and we drifted slowly forward. Our first gator was just up ahead. A female, Tyler told us, who nests in that same area every year. While many alligator babies will fall victim to other large predators, this certain gator’s offspring are known to do fairly well as the mom always places her nest high on the berm, hidden and away from the water’s edge. I snapped a couple pictures, before my interest turned to the large birds soaring and dipping over the trees along the edge of the lake up ahead. Bald Eagles. Several of them were juveniles, having yet to develop their signature white cap, but they dipped and twirled playfully with one another, either mating, or practicing for later. And while the big female was our first alligator of the day, she wasn’t our last, as we spotted a small five year-old floating on a mass of lily pad roots not long after, followed by a couple more on a dried up patch of marsh catching the hot rays of the sun. My bird count also continued to rise as I added Cattle Egrets, a Kingfisher, Great Egret, Purple Gallinules, and both the White Ibis and Glossy Ibis. However, perhaps most awesome, was the Roseate Spoonbill. It was a brief sighting, our boat speeding past, all of us pointing to the bright pink feathers among the green and brown of the marsh. While the pink immediately screams flamingo, the large bill suggests otherwise. Unfortunately, as we cruised past the Spoonbill took flight, preventing me from getting a good shot, but he flew first overtop and alongside our boat for a few seconds before banking left and disappearing. And while the pink bird is a sight to behold in the Florida marsh, what makes the sighting much more special is the rarity of the bird. The Roseate Spoonbill was almost wiped out by hunters many years ago who killed them for their brightly coloured feathers. However, the bird is now listed as threatened in the state of Florida (not federally), and the practice of plume hunting has been outlawed. Regardless, while I don’t keep a tally of the birds I’ve seen throughout my life, I always make note when I see a new one for the first time. This was a first for me, so naturally, I was pretty stoked about it. I could go on for ages about the birds we saw. 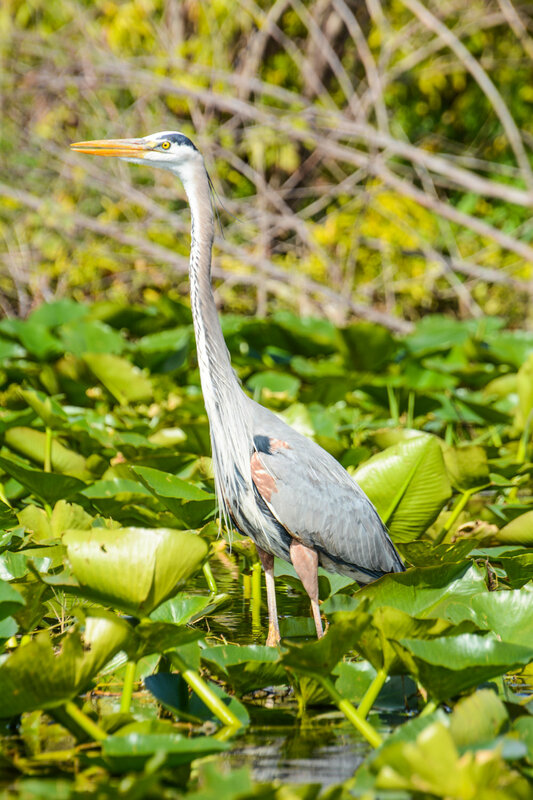 I could go into detail about the hunting behaviour of the Great Blue Heron who can stand like a statue over the water for ages, and then strike like lightening, impaling a fish in its beak. Or I could talk about the beauty of the Great Egret, or the twirling intricacy of the mating Bald Eagles, but I’ll spare you all that for now. I think I’ve shared enough. I will add one more thing though. I cherish these moments to see these birds and all the other animals in their natural habitats. With climate change altering so much of our world’s ecosystems, a lot of habitats for these birds are changing and influencing not only their breeding grounds, but putting some of their food sources in jeopardy. 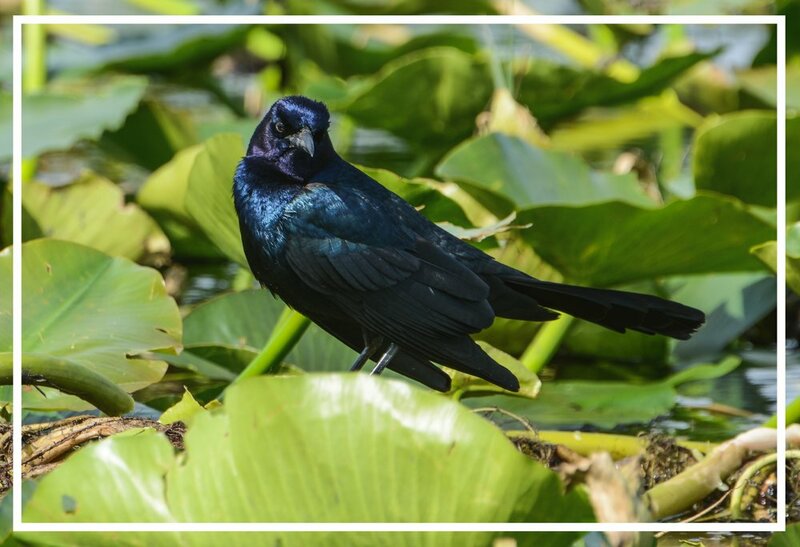 And while this may not be the most pressing of issues for many when it comes to climate change, it could have an impact on a wide array of bird species, not just these coastal birds in Florida. At the very least, I recommend you educate yourself on the potential impacts. With that PSA out of the way, I’ll wrap up this journal, by noting we ended the day back at the condo with a family game night. It was a good time.